If you are planning your holidays to Fuerteventura the following information may help by giving you an overview on the island. 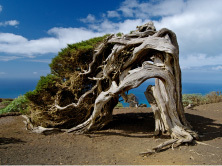 Fuerteventura is the largest of the Canary Islands after Tenerife, and is arid and desert-like. 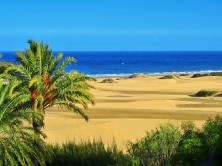 Fuerteventura is perhaps most famous for it’s beaches, with over 50km of stunning white and golden sand. Despite tourism being a relatively recent phenomenon on the island, there is a well developed infrastructure with golf courses, a zoo, a water park and numerous marine excursions. 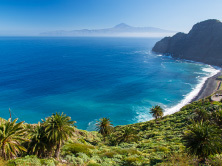 Fuerteventura is the most easterly of the Canary Islands and is only 100km from the coast of Morocco. The geographical position of Fuerteventura means that for many tens of thousands of years sand from the Sahara has been deposited on Fuerteventura’s shores. 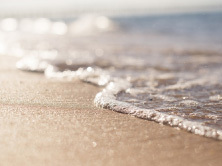 The result of this process is 125 miles of some of the world’s best beaches. Without doubt Fuerteventura has some of the most impressive beaches in the whole of Europe. 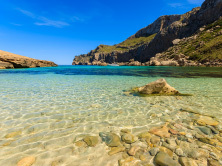 There is such a vast expanse of sand here – from the golden sand dunes of Corralejo in the north to the miles of flat beaches in Playas de Jandia in the south. 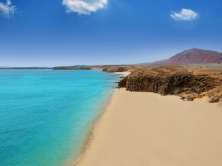 This makes a holiday in Fuerteventura an ideal choice for the beach lover. If you fancy something a bit more active, Fuerteventura holidays offer great surfing, windsurfing and kite surfing as well as big game fishing and diving. If you just want to take it easy, then those miles of white sandy beaches make the perfect getaway, even in peak season you should be able to find a relatively secluded spot for yourself. In short, there is plenty for families, twenty-somethings and sports enthusiasts alike on a holiday to Fuerteventura. The climate is harsher here than on the other islands thanks in part to a cooler prevailing wind called gota fria. Eating out will be an enjoyable part of your Fuerteventura holidays. Because of the hot climate Fuerteventura’s cuisine is quite simple and yet extremely tasty. Obviously the most common food is fish this is generally served up with locally produced sauces and flavourings. A lot of dishes served are centuries old such as ‘gofio amasado’ this is made from a doughy mixture of gofio (like a grain flour) water, milk, broth, potatoes, honey and wine. This is then served in a leather or fabric bag called a ‘zurron’. Papas arrugadas- small unpeeled potatoes steamed with lots of salt until the skin becomes wrinkled and served with a hot ‘mojo’ sauce. Sea bass, Cazon con mojo, Parrot fish or vieja, Sea bream, Tunafish, Sword fish, Shark. All of the above dishes are normally salted and poached then served with papas arrugadas hot sauce and freshly cooked vegetables. Last but not least, is ‘queso majorero’ a local goats milk cheese that comes in many different flavours and textures and is quite simply delicious. The goat cheeses produced on Fuerteventura are sought after not only in the archipelago but outside of the islands as well. Fundamental factors determining the quality of this cheese are the rich pastures from a land that is dry but pleasant, and the unsurpassable characteristics of the Majorera goat, a very adaptable rustic animal which produces a thick, aromatic and high-fat milk. During the Middle Ages, Fuerteventura was known as Maxorata and the name of the cheese “queso Majorero” comes from the adjective denominating the inhabitants and products of the island. The milk, along with the talents of the Majorero cheese-makers is the main secret of one of the best goat cheeses in Spain. Queso Majorero is normally available in large sizes presented in three different ways: natural rind rubbed with oil, rubbed with pimenta or with “gofio” (roasted cornmeal]. Whether you’re looking for trendy surf wear to look the part on the beach, or the latest in gadgets, you’ll find plenty of shops to suit everyone’s tastes on your holidays to Fuerteventura. Corralejo Shopping – Plenty to offer here all along the main street from clothes shops to perfumes, jewellery, electrical goods. There is also a beautiful Canarian style shopping centre called El Campanario which is gradually taking on more and more shops. Even if you’re not too keen on shopping it’s well worth a visit to sit a chill in the plaza or go to the top of the bell tower and take in the sights of Corralejo. Just don’t go up to the top of the tower on the hour unless you have ear plugs! 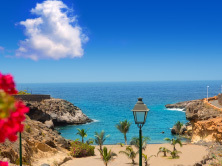 Costa Caleta Shopping – The main resort of Costa Caleta has a quite a few commercial centres with electrical retailers, clothes shops, jewellers and perfume shops and more. 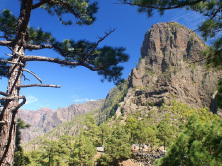 The Atlantico centre is the largest shopping centre just on the outskirts of Costa Caleta. There’s lots of shops here selling clothes, shoes, toys, games, gadgets and more, there’s also a multi screen cinema (which sometimes shows movies in English), an amusement arcade and ten pin bowling. Puerto del Rosario Shopping – Shopping in Fuerteventura has changed quite a lot since the opening of the largest shopping centre in the Canary Islands, Las Rotondas in 2006. Las Rotondas has a commercial surface of 30.000 m2 packed with well known Spanish and English high street names such as Zara, Pull and Bear, H&M, C&A, Bershka, Womens Secret, Game, Jack & Jones, Quicksilver and more. Las Rotondas is located in Puerto del Rosario, and situated between two roundabouts and the streets of Profesor Juan Tadeo Cabrera, Francisco Pi y Arsuaga, Duero and the main road to the airport. Morro Jable shopping– The main street in Morr Jable is the place where most tourists head for their daily dose of shopping, the old part being the place the locals shop so you’ll find this a bit busier.